Uses: as a tonic; for aches and pains; for skin care. It is widely used to combat breathing problems, both the bronchial and asthmatic sorts. Anyone who has ever had a cold will surely recognize this celebrated cold treatment, one of the most powerful-smelling ingredients in chest and head-clearing ointments, inhalants and in cough sweets. There are something like 500 varieties of eucalyptus. 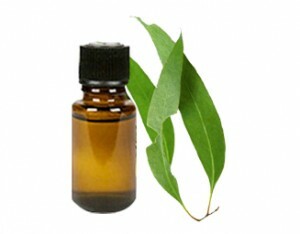 The one used most for commercial essential oil is Eucalyptus globulus, which is the famous blue gum tree of Australia. The oil is distilled from the leaves and is top note. Feeling sleepy? Don’t want to feel sleepy? Few essential oils can clear the fuzz away like eucalyptus. It can also give relief on a muggy, hot day. Methods for eucalyptus as a tonic: water; applicators; vaporizers; massage. Like quite a number of essential oils, eucalyptus can be helpful with general pains and swellings, but its main strength is in providing relief and respite for tired, over-worked muscles. This is the one for post-aerobic stiffening, or for pulls and strains. Methods for aches and pains: water; applicators; massage. Eucalyptus is one of the stronger antiseptics among essential oils, and its cooling, anti-inflammatory, insect-repelling properties make it a natural choice for stings and bites, rashes, flushed skin and spots. Method for skin care: applicators. Coughs, colds, throat infections, catarrh, ‘flu, blocked sinus, asthma – all such constrictions and congestion can be relieved with eucalyptus. The antiseptic action may help clear away some conditions, and the invigorating vapors will make you feel better. Methods for aiding breathing: water; vaporizers; massage. Eucalyptus tends to have practical uses such as dissolving oily substances, rather than stirring romantic notions. However, its harmonizing nature can help cool overheated emotions in conflict.